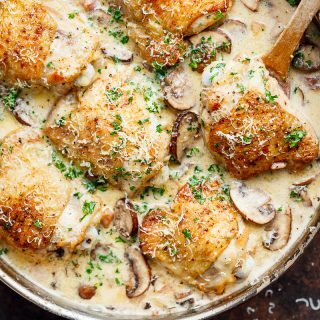 A thick and lightened up Creamy Parmesan Herb Chicken Mushroom with a kick of garlic is your new favourite dinner recipe! With a NO heavy cream — or ANY cream — at ALL option! 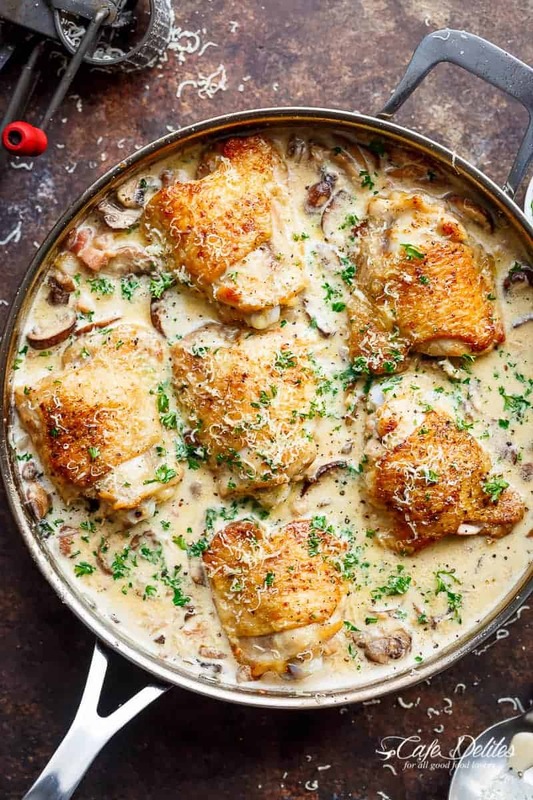 Crispy skinned chicken simmered in a beautifully thick and creamy sauce, using NO cream in a creamy sauce with a mixture of herbs, a good kick of garlic and parmesan; simple ingredients for maximum taste. 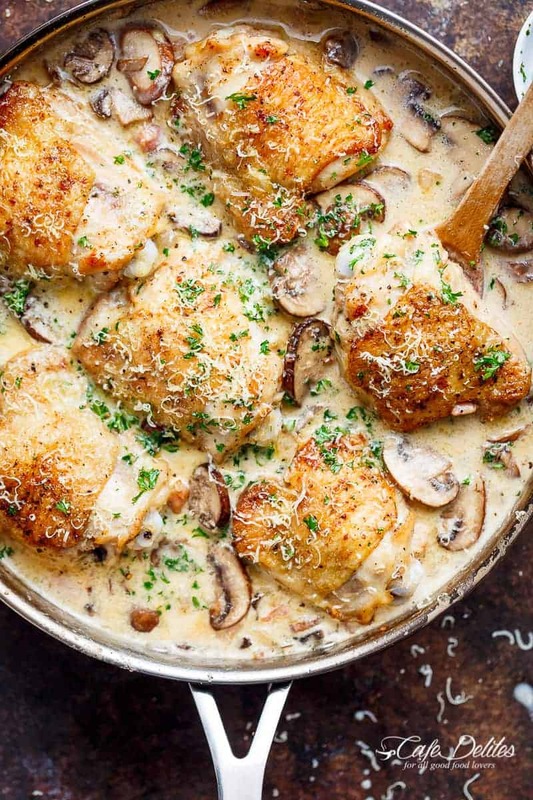 Creamy Parmesan Herb Chicken Mushroom with so many flavours in the one pan. This is the first recipe I’m sharing with you all for 2017. A low fat alternative without depriving us of any flavours. This chicken was SO GOOD, I had to make it a second time right after everyone had eaten, because they ALL wanted MORE. And since then, we’ve made it at least once a week since I first introduced the family to all of these flavours (back in October, 2016). It seems totally unfair I’ve been holding onto this for so long without sharing it. Truth be told, I didn’t think the photos were good enough to share them. Well, must’ve had rocks in my head. As with all of my chicken thigh recipes, you start this one off by searing them first to get the skin nice and crisp. After that; make your sauce and finish it all off in the oven until the chicken is completely cooked through. Of course, if you want to use chicken breasts you CAN do so without baking. Just continue simmering them in the sauce until they are completely cooked through. 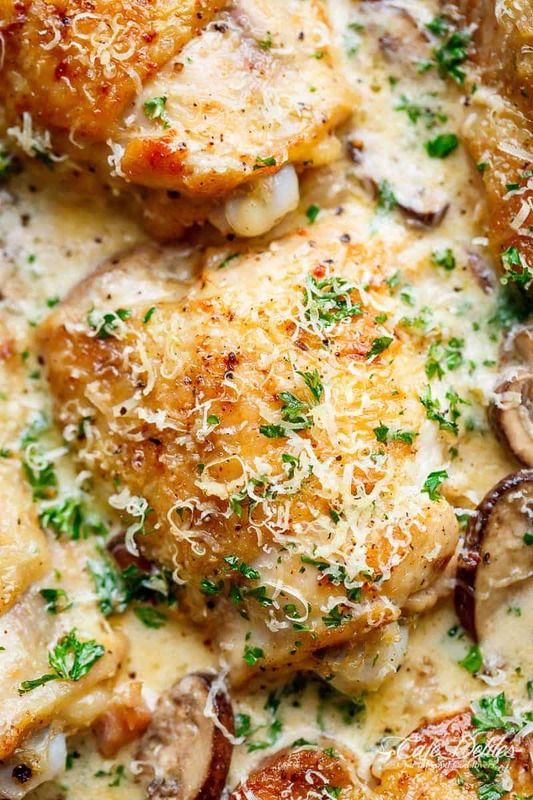 A thick and lightened up Creamy Parmesan Garlic Herb Chicken Mushroom with a kick of garlic is your new favourite dinner recipe! With the option of NO heavy cream at ALL! Season chicken with garlic powder, salt and pepper. Heat cooking oil spray in a large, non stick and oven-proof skillet over medium-high heat until hot. Sear chicken thighs until golden and crispy on each side (about 3-4 minutes each side). Transfer chicken to the oven and roast until completely cooked through, (about 25-30 minutes). Once chicken is done, transfer to a warm plate and set aside. Drain some of the excess fat from the skillet, reserving 2 tablespoons for added flavour. Return skillet to the stove over medium-high heat and sauté the garlic in the pan juices until fragrant (about 1 minute). Add the mushrooms, herbs and 2 teaspoons of parsley and fry until mushrooms begin to soften. Reduce heat to low-medium heat, add the milk (or cream) and bring to a gentle simmer, stirring occasionally, and being careful not to boil. Add in the bullion powder and season with salt and pepper to your taste. Pour the milk/cornstarch mixture to the centre of the pan, and continue to simmer while quickly stirring the mixture through until the sauce thickens. Add 1/2 cup of parmesan cheese; allow sauce to simmer for a further minute until cheese melts through the sauce. Add the chicken back into the pan and allow to simmer for 1-2 minutes in the cream to take on the flavours. Taste test and add extra salt or pepper, if desired. At this point, add in the optional add-ins, if desired. Allow spinach to wilt (if using). Sprinkle with the remaining 1/4 cup of parsley and 1/4 cup parmesan cheese. Serve with steamed rice, over steamed vegetables or pasta. *To substitute chicken breasts for thighs, there is no need to continue to bake them in the oven. After adding the breasts back into the pan, continue simmering in the sauce until completely cooked through. **If you don't have to oregano and dried basil leaves, use 2 teaspoons Italian herbs. ***For DAIRY FREE OPTIONS: Substitute evaporated milk with almond, coconut or rice milk. SIDE NOTE: Alternatively, replace the evaporated milk with half and half, heavy cream, thickened cream or a reduced fat cooking cream. If using any of the creams suggested, do not add the cornstarch mixture. You won't need it. PLEASE NOTE: Due to some readers having difficulty with this recipe, I have retested it and found the original recipe posted works fine, as it has for many other readers. However, I have modified the recipe since posting for a better outcome for future readers! ENJOY! Very good recipe! Very tasty! Definitely a keeper. Thank you! Sooooo good! I only had one clone of fresh garlic so had to use garlic powder. Didn’t have oregano so I used thyme. And used one giant button mushroom cap. Definitely will be making again. So easy and forgiving. I don’t have bullion so can I use chicken stock? And if so how much? I will surely do. I will post a photo after making the dish. I made this tonight for my family of 5. I used flour in the sauce which worked great. I also added thinly sliced strips of red bell pepper to the sauce. I added roasted choppes fennel and carrots with the chicken thighs which i diced after cooking. Delicious! I will absolutely make this again. Thank you for a fantastic meal! What is the nutritional info on this dish? I like to use myfitnesspal.com to look up any nutritional information. Hope that helps and you are able to find an answer to what you are looking for. Thanks so much for following along with me! I have had this recipe save for quite some time now and going to try it tonight! I have read all the comments and all are good so i’m hoping that this will be a hit also with my family! Fingers crossed! I made this tonight and it was a huge hit. My 2 year old ate 3 helpings (small but still) and he’s not wanting to eat much at all right now so this was a huge success. I added spinach and made it with cream and it was amazing! Thanks for this wonderful addition to my dinner rotation ?? Made this tonight using chicken breasts split in half (they’re thick breasts). I did put them in the oven to finish cooking. I used fresh herbs, button mushrooms that I sliced, and followed the recipe as stated. I cooked pasta because we’re having a rice dish later this week. I mixed the pasta in with the chicken and sauce, oh my goodness ??? ?, you will not be disappointed. Thanks so much for such a great review! I really appreciate it and am so glad that you enjoyed this chicken! Thanks so much for following along with me! Wow, OK I made this without chicken bullion powder, oregano, parsley, Basil and mushrooms; I added onions. It turn out to be such a delicious dinner. All three of my children ate it all and had seconds. This is unusual for my kids. My husband and I also thought it was amazing. Not sure why, but after putting it in the oven I want left with juice. Maybe I didn’t put enough oil at the beginning. It made no difference as it was a hit tonight. Family is full and happy so I am thrilled. Thanks for this amazing dish. Oh my goodness. This was so good! So simple, yet so delicious. all the flavors are amazing together. My oven isnt working, so i had to just cook my chicken all the way through on the pan. i added spinach because i love spinach in pasta. i didnt have fresh parsley so i had to use dry parsley. next time ill use fresh just to see what the difference in taste is. i added it over angel hair. i will definetly be making this again. That is awesome that you made it your own! I love all the additions and substitutions. It sounds delicious! Thanks for sharing! so does it work best with thighs or breast? Hi Sam. I haven’t tried it with flour so I can’t really recommend it! Made this dish last night and it was EXCELLENT! I went with heavy cream and it truly was one of the best chicken recipes I have had. Not hard to make and I served it over rice. Will be making this regularly! YUM! I’m so happy to hear that Natalie! Thank you so much for sharing your feedback! really good! particularly loved the sauce. We do like cream sauces (i know, i know —- not as healthy, but, well — CREAM…) I used 1 cup of whole milk & 1/2 cup of heavy cream and let it thicken without the cornstarch. It was perfect! This will be going in our regular rotation. 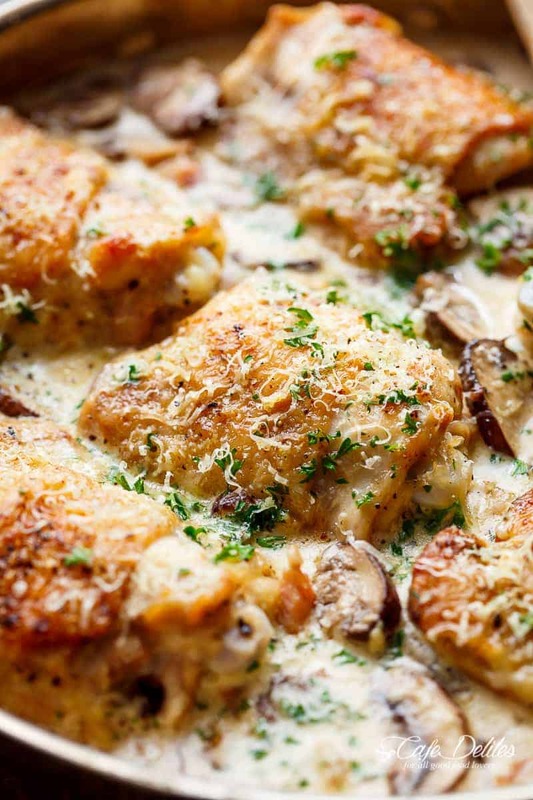 Those photos are making me so hungry right now, and I’m craving all the creamy parmesan herb chicken even though I’ve only just had breakfast! I tried this recipe a couple of weeks ago and my family and I loved it! I love that it doesn’t take me long to make and that all I need to do is make more of the pan sauce to make it perfect. The success of this meal tells me that the other meals on this website will be well worth my time to make. My comment was Supposed to rate 5 stars!! sorry! look at my correction here please. it deserves 5! I made this for dinnet tonight. Everyone loved it! I used chicken breasts and never put them in the oven, just checked temp to make sure they were cooked through. I used almond milk to lower the calories even more. You would never know. Delicious! So. Easy and so flavorful. My new go to chicken recipe! Just made this. It came out absolutely delicious. I did substitute dry parsley for fresh parsley(out of sheer laziness) but it was still SOO good. It was flavorful, the chicken was moist, and the milk mixture came out perfect. Oh, I would also like to add that I am not a fan of mushrooms, but the seasonings made them absolutely delicious. I wish I had added more! Thank you for the great recipe! Will definitely make again! What kind of mushrooms are those? My husband loves Parmesan cheese so I had to try it out! It was so good, especially with the crispy chicken skin. I was surprised how fast the cream thickened up. I usually have trouble getting my sauces to thicken so I was very happy how easy it was. Delicioso! Made this recipe on a weeknight, after a long day at work and then driving around the city collecting our three kids. It wa as flavorful, quick meal that everyone loved (including my picky 6 year old). I love love any pasta with a cream sauce but will have it maybe once a year due to it usually being high calorie and high fat. This recipe is a great guilt free alternative. Next time I make it I will purchase a better quality, fresh parm cheese for better flavor. Otherwise this recipe was great! Hello! This all looks delicious and I would love to give it a try! Do you post the nutritional facts at all?